On Sale Now! Free Shipping Included! Save 8% on the Le Pan 1.6'' Touchscreen Smartwatch for Android & iOS - Gunmetal (L11-Gunmetal) by Le Pan at DJ Luu. MPN: L11-Gunmetal. Hurry! Limited time offer. Offer valid only while supplies last. Welcome to the future. It's nice. We've been here a little while and things definitely seem cooler. Here's a great example - the Le Pan smartwatch. Welcome to the future. It's nice. We've been here a little while and things definitely seem cooler. Here's a great example - the Le Pan smartwatch. 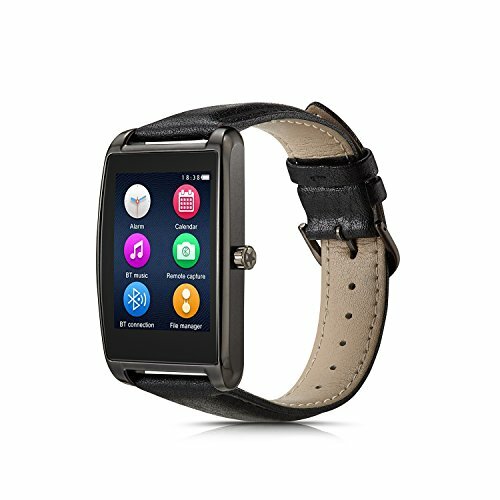 Primarily designed to enhance the convenience of your Bluetooth-enabled smartphone, the Le Pan smartwatch has a 1.6" touchscreen that offers intuitive interaction and delivers real-time information about your incoming calls, texts and social media business right to your wrist. Now, you can check the alerts and notifications arriving to your phone by simply and discreetly glancing down at your Watch. You'll stay in-the-know and do it Without causing a scene or being "that one person" who's always checking their phone. The rechargeable Le Pan smartwatch can also help you monitor your important fitness details like how many steps you've taken and your Heart rate. If you have any questions about this product by Le Pan, contact us by completing and submitting the form below. If you are looking for a specif part number, please include it with your message.